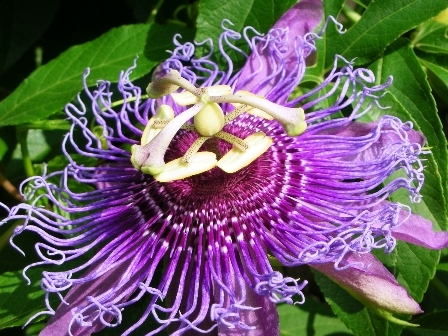 Maypop is a vine native to the South Eastern United States. It is often seen growing on the edges of fields, along side ditches and other sunny, moist and fertile places. It thrives in areas with lots of available sunlight. It is not found in areas of growing forest, however, as the sun is blotted out by growing trees. It is also planted in home gardens mostly as an ornamental vine. A fast growing perennial vine that employs tendrils to grab hold of adjacent shrubs, structure and other supports to lift itself to heights of 8-12 ft (2.4-3.7 m). Leaves large, serrated, 13-15 cm wide and 15-20 cm, long. They typically have three to five lobes and are arranged alternately on the stem with flowers and branches emerging from the axil. Flowers 5-7.6 cm wide, and are composed of 10 white petals arranged in a shallow bowl shape above which is arranged fringe of purple and white filaments, called the corona. In the center is the white fleshy stigma surrounded by five stamens. 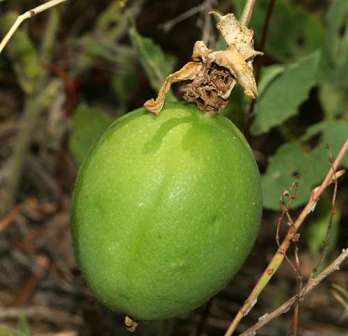 The fleshy fruit, also in itself called a Maypop, is an oval yellowish berry about the size of a hen egg; it is green at first, but then becomes orange as it matures. In this species, the yellow mucilage around the seeds of the fruit is sweet and edible, however it is quite seedy and mostly benefits wildlife. 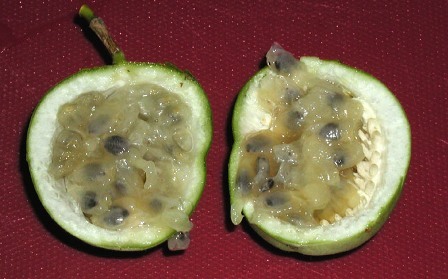 Fruit are fleshy, ovoid to globose, green at first, yellowish-red at maturity. Fruits can be eaten fresh of the vine. The edible portion is the yellow mucilage around the seeds which is sweet. The fruits taste somewhat like guavas. 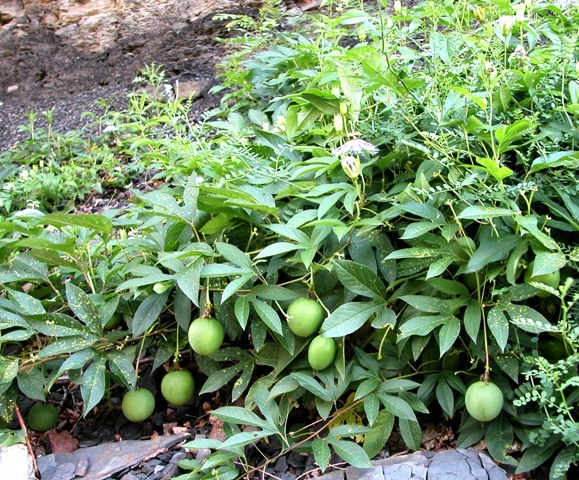 However, mayhop quite seedy and therefore is not liked a much as the passion fruit. The fruits may also be made into a jelly. The dried vines are used in herbal medicine. The plants thrive better at sunny locations. The soil should be light and rich in organic matter. 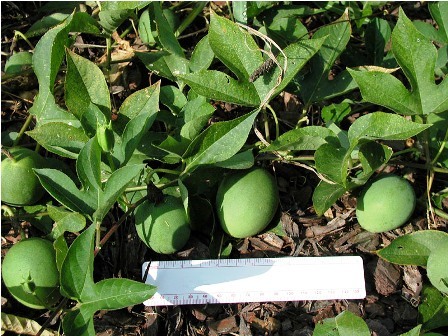 Maypop can be propagated from seed as well as from cuttings. The vines require trellising or some other kind of support.